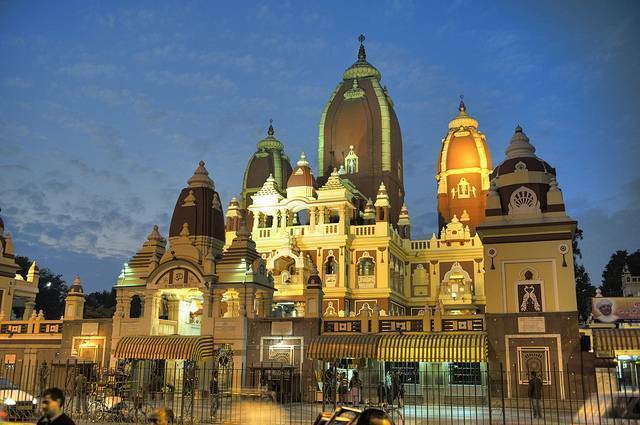 Lakshmi Narayan Temple, otherwise known as “Birla Mandir” was built from 1933 -1939 by Father – Son Duo Baldeo Birla and Jugal Kishore Birla of much famed Birla Industries. The Temple is dedicated to Lord Vishnu. In this Temple Sanctum Sanctorum houses deities of Lord Vishnu and Goddess Lakshmi and thus named as Lakshmi Narayan Temple. Beside main Temple, there are also small shrines for Shiva, Krishna and Buddha. Established over 7.5 acres, one can come across number of shrines, well maintained Garden, decorated water fountain and Geetha Bhawan for expositions. Constructed in Nagara Hindu Architectural style, Lakshmi Narayan Temple is highly decorated with carvings which illustrate the scenes form Hindu Mythologies. Nearly 100 artisans have contributed for this Temple construction. One can easily reach the Temple from Connaught Place which is nearby the Lakshmi Narayana Temple.